What makes military weddings unique? What makes a military wedding different from a typical wedding? Of course, like all weddings, it’s a ceremony bringing two people together officially as a married couple. But a military wedding — when one or both parties are serving or have served in the military — brings its own customs and traditions that make the wedding extra-memorable for the couple and their guests. Medals and ribbons take the place of a boutonniere. Soldiers forego floral as boutonnieres are not to be worn on uniforms. Military personnel attending the wedding are expected to be in full dress uniform. Evening dress uniform is similar in formality to a civilian white tie and tuxedo. For those in the military who are not officers, dress blues or Army green uniforms may be the formal or informal attire for weddings. Who knew that cake cutters could take on the Air Force style? These make for a unique military wedding addition, even if it’s just for decoration, or a post wedding memento. Military weddings are always full of inspiration. 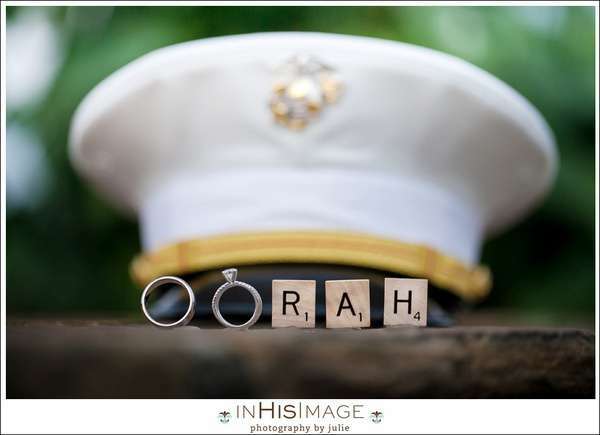 This picture incorporates the wedding rings with the groom’s Marine chant to give this shot special meaning for the wedding couple. Sewing a soon-to-be husband’s military name tag inside a wedding gown really adds a honorable and sentimental touch to a dress. In this case, it was the name of a Navy man. A traditional wedding custom like cutting the cake takes on new meaning when done with military flair when the couple uses a large military sword, or saber instead of the typical knife. To further honor the military theme of a wedding, reception tables can be given company names rather than standard table numbers. We’ve also seen it done with military post names. Some traditions include women who are on active duty wearing their boots under their gorgeous dress to walk down the aisle with military pride. 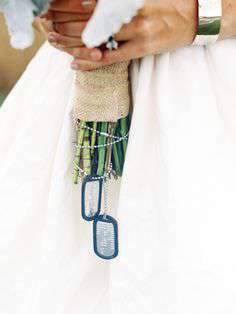 Flowers are beautiful, especially when they are decorated with a couple’s dog tags. This is a unique wedding tradition that gives a deeper sentiment to floral arrangements. The opportunity to get creative with representing both the wedding couple’s love as well as their military ties is endless. Couples and wedding photographers are sure to come up with their own special ideas like these wedding bands on the tip of a sword. 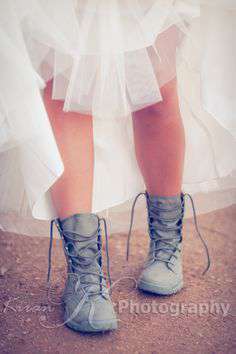 Playing on the soldier theme can give you all sorts of creative ideas for pre-wedding photo fun, like this cute example. Seems both bride and groom have important jobs, here. The brilliant white of this Naval full dress uniform is radiant. There is no limit to how the special significance and symbolism of a military wedding can be played out in photographs. This is a perfect military sign to hang up for an outdoor Army wedding, or lining the walkway on the way into the venue. Tree decor is very popular in outside weddings and can also be used as a guide for guest to find the reception hall. With every branch of the military represented, bridal garters are another way you can customize your wedding day attire. Some brides prefer to wear these rather than the traditional lacy undergarment. This one in particular is an army garter. Many civilian weddings end with the to-be-expected a limousine or other shiny, decorated car decorated in tin cans and a sign that reads, “Just Married” on the back window. However, some active duty couples may prefer to leave the festivities of their big day in a different style. Like, a military helicopter for example. Impressive! There are so many ways to personalize wedding decor in a meaningful way with the military couple’s unique story, like what is shown here. Oh so genuine and poignant. One of the most popular and regal of military wedding traditions is the sword or saber arch, typically done for the recessional. Another beautiful tradition is the recessional that takes place at military weddings is the arch of swords and sabers. The Navy and Marine Corps take part in the ceremony by appointing eight marines and sailors to stand and make an arch with their swords above the newly wed couple as a symbolic gesture of honor and loyalty to them as family. For this, the command is, “Officers, Draw Swords”. After this command, the swords are drawn from their scabbards in sync, and then slowly rising to meet the tip of the opposite sword. The Air Force differs from these two branches, because they use sabers rather than swords to form the arch. Only the bride and groom may pass underneath the arch during the entirety of the ceremony.